Ever since Marvel’s Avengers destroyed the box-office in 2012, every studio with super hero franchises has been looking to follow suit. It’s not just about comic book franchises; it’s about building a comic book universe. It’s been a long dark period for the X-Men ever since the regrettable 2006 debacle The Last Stand, which callously killed characters, butchered others, and botched the most famous storyline in the history of the comic. In 2011, Matthew Vaughn proved there was still life to be found in the franchise with his terrific 60s-era prequel, X-Men: First Class. Now, post-Avengers, Fox is salivating at combining the past X-Men and the present X-Men into one colossal movie with a colossal budget. Back on board is director Bryan Singer, the director of the first two X-Men films and the man who helped kickstart the modern superhero era. If that wasn’t enough riding on the film, X-Men: Days of Future Past also follows the second most famous storyline in the history of the comic. In the horrible future, killer robots known as Sentinels hunt down mutants. These are the invention of Dr. Boliver Trask (Peter Dinklage), a military scientist who was killed back in 1973 by the vengeful shape-shifting mutant, Mystique (Jennifer Lawrence). The murder convinced humans to subsidize Trask’s killer robot plan of defense. Thanks to experiments replicating Mystique’s mutant ability, the Sentinels have the ability to adapt to any power, turning them practically indestructible. In the future, the Sentinels are eradicating all mutants, mutant sympathizers, and eventually human beings. Magneto (Ian McKellen) and Professor Xavier (Patrick Stewart) have teamed up with a small band of surviving mutants, including Wolverine (Hugh Jackman). Thanks to the phasing powers of Kitty Pryde (Ellen Page), they can send Wolverine’s consciousness back to 1973 so that he can prevent the Trask assassination. The only ones who can help Wolverine is the younger Xavier (James McAvoy) and Magneto (Michael Fassbender), former mentors to Mystique. Except Xavier is a recluse and strung-out on drugs to dull his powers and Magneto is locked away underneath the Pentagon. The X-Men films have always had a topical advantage to them that provided a weightier sense of drama than your typical story about a reluctant soul blessed with amazing powers. The mutant allegory automatically applies to any sub-group facing oppression mostly through fear and ignorance. What other superhero franchise has two opening scenes in a German concentration camp? The stakes are even larger with this movie because of the Horrible Nightmare Future that must be prevented. Now we all assume said Nightmare Future will be avoided by film’s end, so the movie provides a proverbial reset button that the filmmakers can have fun with, and they do (look out future mutants). Excluding the Nightmare Future framing device that becomes an unnecessary parallel storyline, the majority of the film takes place in 1973. If X-Men: First Class tapped into the groovy optimism and “take me for what I am” sense of social justice of the time, then this film certainly taps into the disillusionment of the 1970s, where the promise of reform and hope morphed into anger and cynicism (hey, that’s like us today!). This loss of innocence is typified in Mystique, who becomes the central figure of the movie in many ways. Her seething desire for vengeance is what animates her, as well as the pain of betrayal from the men closest in her life, as well as the world who once held such promise. Also, Jennifer Lawrence (The Hunger Games) has become one of the biggest female stars on the planet, so it makes sense to bolster her role. The central conflict is stopping an assassination, one domino that leads to many others, but it’s emotionally about Mystique having to confront her feelings of hate. It’s another platform for the ongoing conflict of perspectives between Xavier (restraint, tolerance) and Magneto (strong defense, eye for an eye). But as I found in First Class, it’s hard not to agree with Magneto as human overreaction leads to rash and thoughtless actions, like Horrible Nightmare Future. That’s not to say that X-Men: Days of Future Past fails to deliver when it comes to the popcorn thrills and action highs we crave in our finest summer blockbusters. The action set pieces are large without dwarfing the characters, playful and imaginative without losing a sense of edge and danger. I loved how the character Blink (Bingbing Fan) would utilize her mutant power of opening portals as a fighting strategy. It makes action sequences so much more inventive and visually exciting to throw a series of portals. The pacing is swift short of the second half of Act Two, gearing up for the climactic showdown in D.C. that dominates Act Three. The time travel story starts with a lot of exposition but it gets smoothed out as it goes, the rules of the story fall into place. Every action sequence hits, some admittedly better than others, but it’s the small touches that Singer injects that made me smile most. I enjoyed Magneto pointing a gun, being toppled, but still using his power to have the gun fire in midair. I enjoyed the animalistic nature of the Beast/Wolverine brawl. Jackman is looking even veinier than usual in his bulked out form. Thankfully the fish-out of-water timeline jokes are kept to a minimum. Wolverine is the perfect glue to hold both timelines together. And then there’s that standout Pentagon prison break sequence (more on that later). Singer might not have the most natural instincts developing and staging action, but the man is a surefire talent when it comes to staging eye-catching visuals (I would say the same about Christopher Nolan). Even his unfairly maligned Superman Returns is proof of the man’s cinematic gifts. As far as entertainment value, this is right up there with X-Men 2. I still view Vaughn’s savvy First Class as the best X-film of the bunch, which has only gotten better the more I’ve watched it. 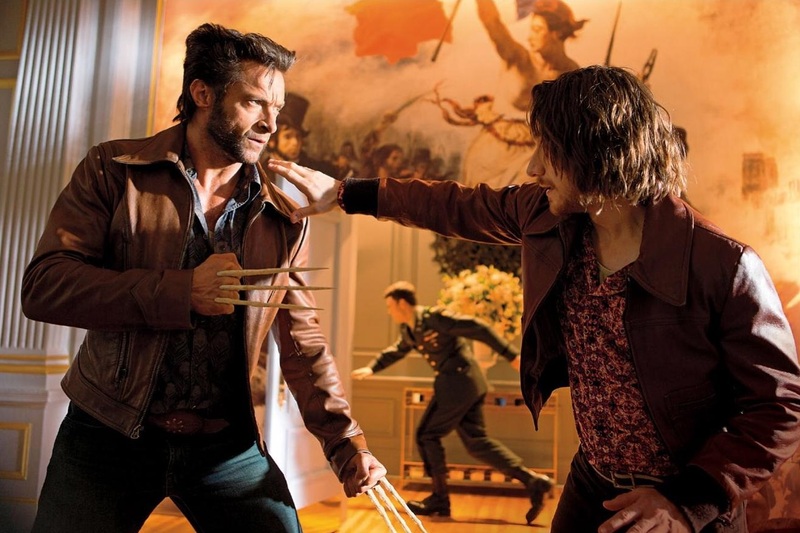 And if that wasn’t enough, Singer’s new film does what every fan has been hoping for: (spoilers) it erases all the crummy X-Men movies, namely 2006’s Last Stand and the first Wolverine solo effort, from the official timeline. It’s time to start anew, toss out the old stuff nobody liked, and forge ahead with a new unified timeline. There can be two parallel X-Men franchises, one present/future and one with the prequel casts, and they can go on forever as desired, or until the prequel cast prices itself out. In one fell swoop, Singer and company have reset the mother franchise and given fans new hope about the possibilities. Make sure to stick around to the very end of the credits for a scene that indicates directly who the next major villain will be in the 2016 sequel. Let me take time to single out just how expertly Evan Peters (TV’s American Horror Story) steals the entire mutant-heavy movie. First, he’s the most comically attuned character, which is a nice break from how serious, and rightly so, every character is so often. Quicksilver provides a whole new jolt of entertainment, and when he checks out after the prison break sequence you’ll dearly miss him. The character is a rapscallion (as my late grandmother might have termed) that enjoys using his super speed powers to mess with people, to test his limits, to see what he can get away with, and a Pentagon jailbreak is right up his alley. Ignore the silly yet period appropriate outfit and ignore what initially seems like Peters’ smirking self-involvement from trailers and ads. When this character is onscreen the movie has a joyful sense of irreverence. 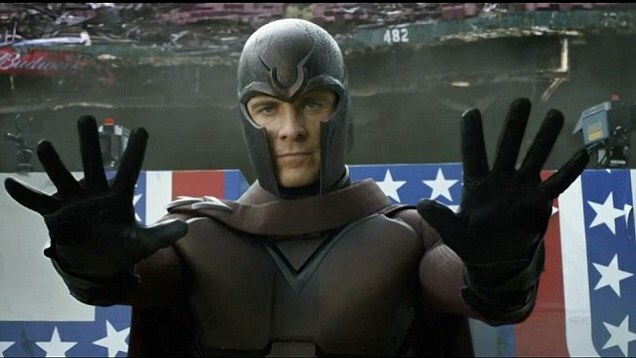 He is instrumental to freeing Magneto and the onscreen depiction of his super speed is the best illustration of the power ever conceived in film and TV. There is a segment sent to Jim Croce’s “Time in a Bottle,” and some wonderful special effects, which is just so playful, so giddy, and so cool that it very well might be my favorite moment in any superhero movie… ever. It is definitely an applause-worthy moment and my audience responded in kind. Quicksilver is a perfectly utilized supporting player in a movie stuffed to the gills with characters. The time travel geek in me has a few quibbles with the parallel lines of action from past and present. Wolverine’s consciousness is sent back in time but he film plays out like it’s happening simultaneously to the events of the future. So if Wolverine is pulled out in the middle of the movie, he’ll have failed his mission to change the future, even though by going back in time he’s already, blah blah blah butterfly effect. Anyway, I understand how they want to make the future story have a sense of urgency but it’s not like waking Wolverine from a dream; the times are not happening concurrently. He’s in the past, meaning that the moment he goes back there, the future will already be altered due to the consequences of his actions, for better or worse. There is no race against time to keep his consciousness back in time until he complete his mission. I can see why they went this route for a summer blockbuster, but that doesn’t quell the quibbles. 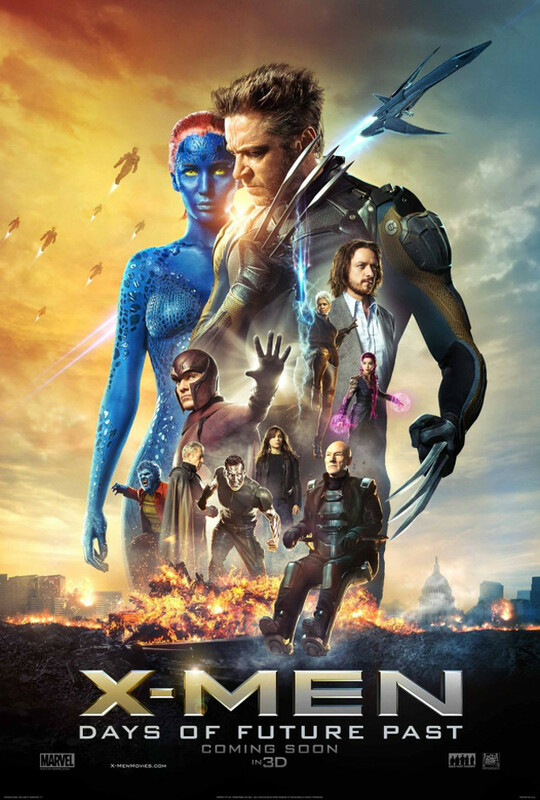 X-Men: Days of Future Past is a time-hopping, unabashedly fun time at the movies; well as fun as preventing nightmarish futures built from the consequences of oppression and prejudice can be. With Singer back in the saddle and the bridging of the two X-Men universes, the series is back on track and once again the promising font of stories and characters. The newest X-film is one of the most entertaining, funny while still being dramatic, and while burdened with the largest cast of any super franchise, finds notable moments for its characters big and small to remind us that these people matter. While less philosophical and funky than First Class, this is one of the best films in the franchise, on par with X2. The action sequences and visual eye-candy are great fun with some inventive and memorable touches. It’s also nerdy fun getting to watch the past and present interact, and for many this is their first return since 2006’s crappy Last Stand. It’s not a perfect movie; I wish there was more early Sentinel action, I wish Dinklage had much more to do, and I wish that the plot didn’t so transparently hinge on Xavier not having his powers. The slate is clean and all X-Men fans can breathe a sigh of relief. The future is once again rosy. The X-Men, and not just Wolverine, are relevant once again. Posted on May 26, 2014, in 2014 Movies and tagged action, annie paquin, bryan singer, comic book, drama, ellen page, halle berry, hugh jackman, ian mckellen, james mcavoy, jennifer lawrence, kelsey grammar, michael fassbender, nicholas hoult, omar sy, period, peter dinklage, sci-fi, sequel, super hero, time travel. Bookmark the permalink. 1 Comment. Good review Nate. Had a whole bunch of fun like this. Reminded me exactly why the franchise was so hot and ready-to-go in the first place. Also, it reminded me why X3 and Origins are utter pieces of garbage.